Find a therapist in Washington with GoodTherapy.org. In 2012, Washington ranked as number 15 in the nation for overall well-being, and 59.4% of Washington residents said they felt optimistic that the area where they live is improving. 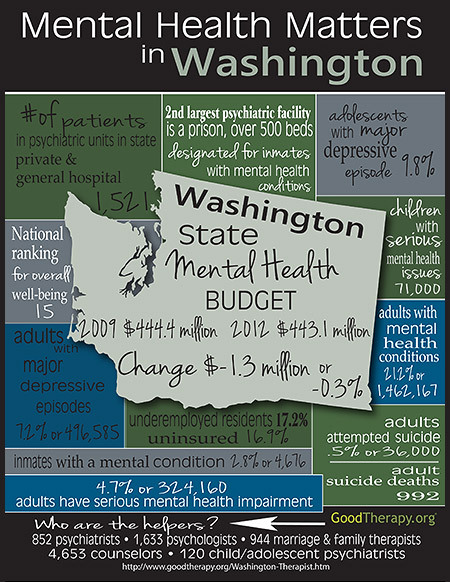 As states across the nation have witnessed dramatic cuts to their mental health budgets, with some budgets slashed by more than 30%, Washington’s funding for mental health programs declined by just 0.3%, or $1.3 million, between 2009 and 2012. Despite ranking high for overall well-being, there are a number of Washington residents affected by mental health issues (21.2%), underemployment (17.2%), and lack of insurance (16.9%). Serious mental health impairments impacted more than 324,000 adults and 71,000 youth across the state. In addition, major depressive episodes affected more than 7.2% of adult residents and 9.8% of adolescents. In 2011, there were 36,000 cases of attempted suicide and 992 fatal suicide attempts. Suicide rates within Washington were higher in areas where poverty affected 10% or more of the population, and suicide was the second leading cause of death for youth between the ages of 15 and 24 in 2011. In Washington State prisons, an estimated 28.7% of inmates qualify as mentally ill. In fact, the second largest psychiatric facility in the state is a prison, with more than 500 beds designated for offenders with mental health conditions. Mild brain injury affects 28% of inmates, and 7.6% have experienced moderate to severe traumatic brain injury. In addition, developmental disabilities are present in 9% of offenders. Many mental health professionals in Washington work to improve the quality of life for all state residents. Throughout the state, there are 4,653 counselors, 1,633 psychologists, 944 marriage and family therapists, 852 psychiatrists, and 120 child and adolescent psychiatrists according to records from 2010. In addition, many Washington residents work toward reducing mental health stigma, like Delaney Ruston, a Seattle-based physician and filmmaker. Ruston’s 2013 documentary Hidden Pictures follows five individuals in different countries around the world who have been diagnosed with some kind of serious mental health condition. She made the film to inspire dialogue around mental health conditions that might help eliminate stigma associated with mental illness and break down barriers to treatment.